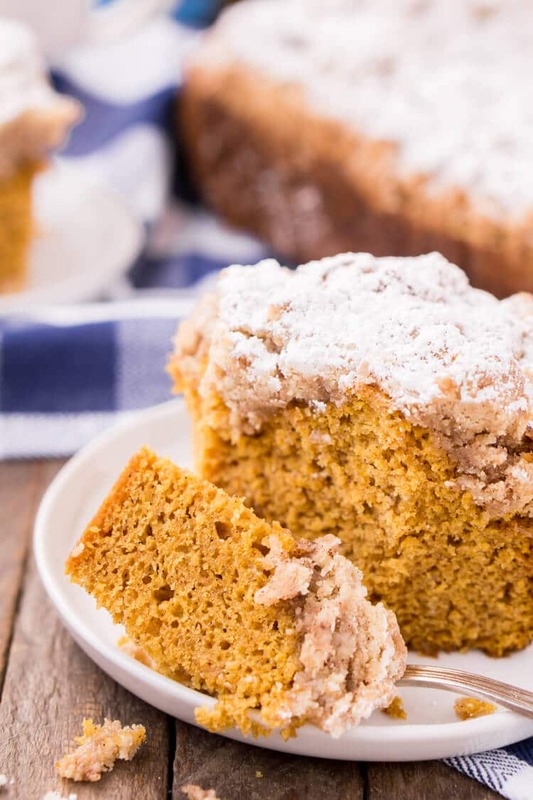 This Vanilla Pumpkin Coffee Cake is light and fluffy with a spicy butter crumble on top! 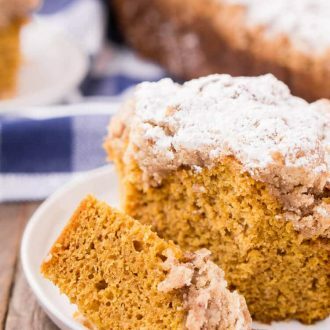 It’s easy to make and a great way to kick start your fall morning! There’s a stereotype that writers are caffeine fiends, and as someone who makes a living by running my own blog, I can tell you that this much is true. I can’t imagine starting my day without my morning cup (or two) of coffee, and I know this is something that many people—writers or not—can relate to. Buying my coffee every day from a shop or drive-thru is a waste of time and money. Plus, I’m pretty particular about getting my cup of joe just right. That’s why I prefer to make it at home. The only thing is, after awhile, the old milk-and-sugar routine starts to get old. The other day I was on my weekly Target run, making sure I was cashing in on deals via the Cartwheel app. I had already picked up my usual bag of ground coffee (on sale! ), and was making my way toward the drink cooler. As I glanced through the glass doors, I noticed several rows of coffee creamers. From almond and coconut varieties to those flavored like vanilla, caramel, and more, I realized that with all this to choose from, there’s no reason at all to get bored with my morning brew! In the past, I’ve steered away from bottled creamers because I figured they were unhealthy. Some are high in sugar and calories. But when I discovered International Delight’s new line of Simply Pure creamers, I was pleasantly surprised. They’re only made with 5 ingredients and are skim-milk based, so they’re only 30 calories per tablespoon—no need to feel guilty about jazzing up my caffeine fix! I picked up a bottle of Simply Pure Vanilla so I could experiment with different flavor combinations. Before I even left the store, concoctions like vanilla-cinnamon coffee and creamy vanilla hot cocoa began to pop into my head. When I got home from Target, I was beginning to feel the onset of an “afternoon slump,” so I decided to brew a pot of coffee and try my new creamer. Boy, was I impressed! 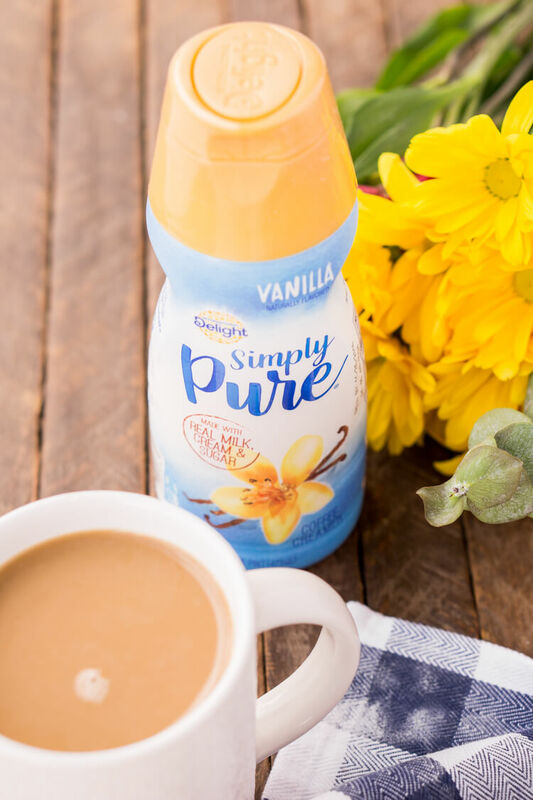 With a splash of Simply Pure Vanilla, my “boring” cup of joe tasted a creamy designer drink—all it was missing was a dollop of whipped cream! Each sip was brimming with smooth vanilla flavor and just the right amount of sweetness. It was the perfect afternoon pick-me-up, an indulgent treat that I could feel good about. Oh, and the caffeine buzz didn’t hurt, either! With my drink in hand, I started thinking about how I could use this rich-tasting, low-calorie vanilla creamer as a light and tasty addition to other recipes. 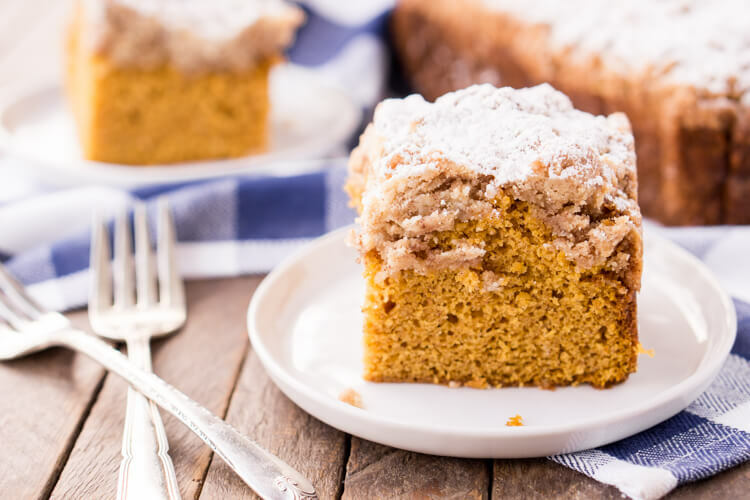 The mellow flavor would be a perfect way to sweeten up my breakfast, and I decided to try adding it to a coffee cake recipe. It would be the perfect accompaniment to my morning cup of coffee! 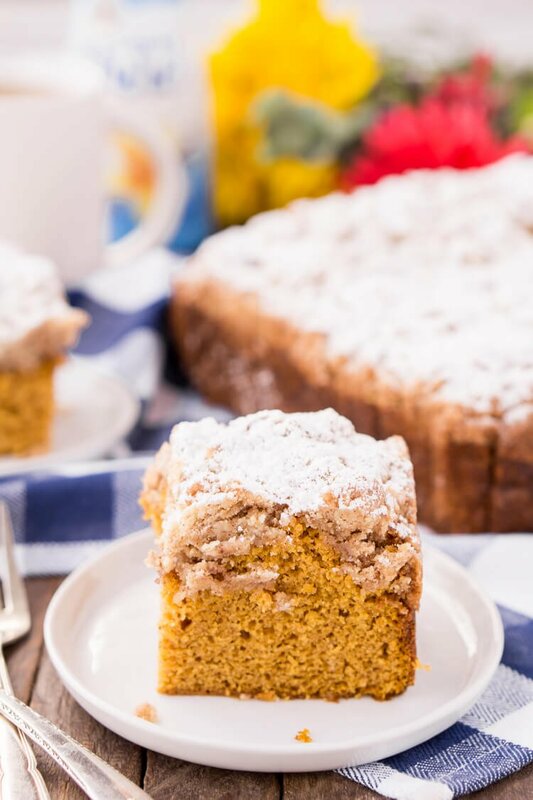 The finished product was a Vanilla Pumpkin Coffee Cake, a treat that perfectly pairs with a hot mug of joe on a brisk fall morning. The soft taste of vanilla swirls with the bold flavors of pumpkin and spice for a taste of the season. The cake is thick but fluffy in texture, and topped with a buttery brown sugar crumble for added richness. 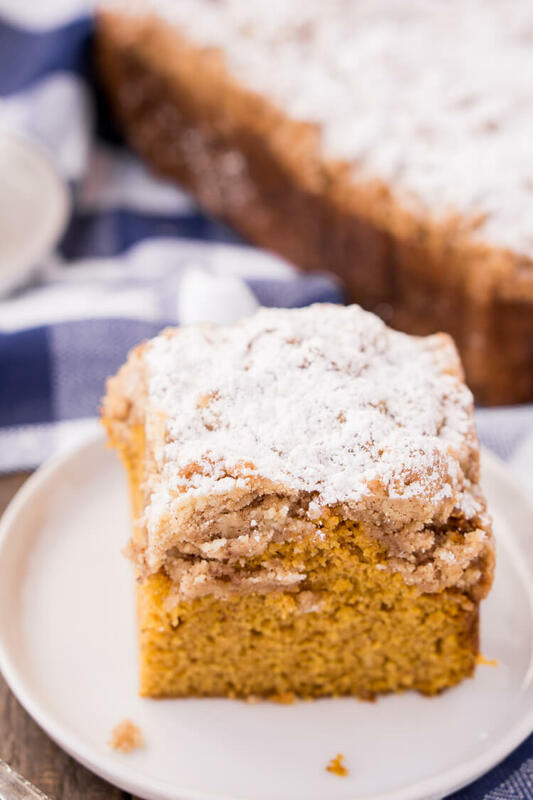 I love this recipe for Vanilla Pumpkin Coffee Cake because it puts a seasonal twist on a traditional breakfast favorite. The next morning, I cut a slice to enjoy with my coffee. With a splash of Simply Pure Vanilla creamer in my mug, I noticed how the mellow vanilla notes jumped out with each sip of coffee and forkful of cake. Talk about a great way to start the day! 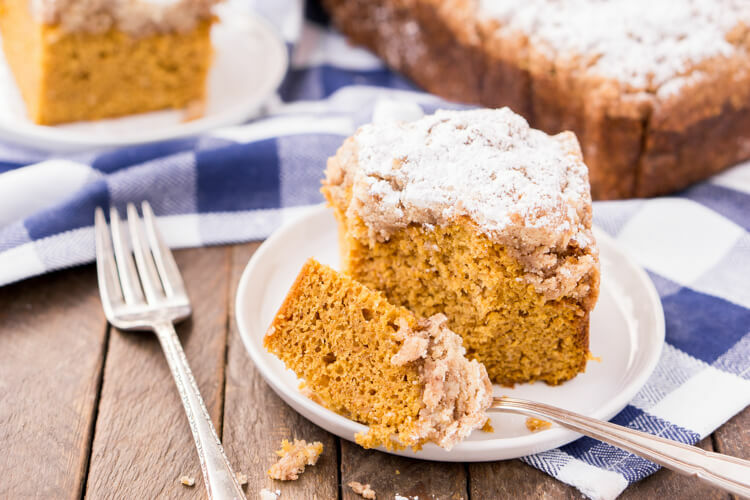 If you crave pumpkin spice this time of year, this Vanilla Pumpkin Coffee Cake makes a delicious breakfast or snack. 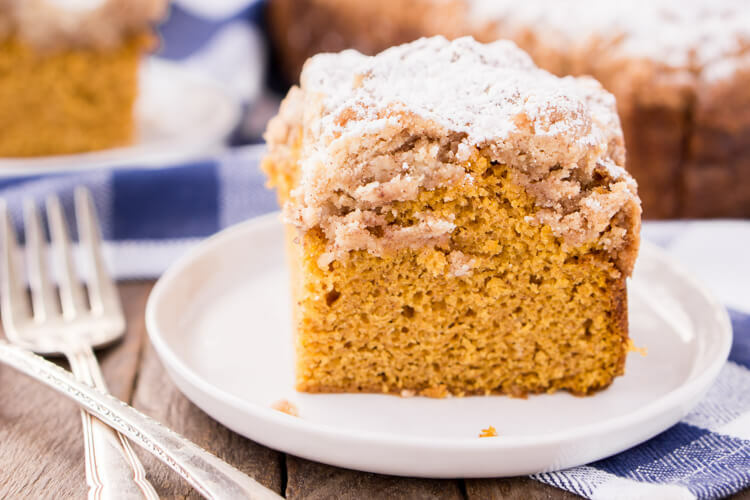 A steaming cup of coffee perfectly pairs with a slice of soft, crumbly cake, and I love how a dose of my new favorite creamer is an essential ingredient in both! If you need to spice up your caffeine routine (and your baked goods) check out Target’s broad selection of indulgent coffee creamers, many of which also fit into a healthy lifestyle. Starting September 25th, several brands and flavors will be an extra 20% off through the Cartwheel app, so you can taste and try more than one delectable variety! This is by far the healthiest, tastiest, and most cost-effective way to enjoy coffeehouse-quality drinks and delicacies right at home. Preheat the oven to 350 degrees F and grease an 8 x 8 or 9 x 9 pan and set aside. In a large bowl or a stand mixer fitted with a whisk attachment, combine all of the cake ingredients and beat until combined. Pour batter into the prepared baking dish. Mix crumble ingredient together in a medium bowl until a thick crumble forms. Use fingers to evenly spread the crumble over the top of the cake batter. Bake 45 to 55 minutes until toothpick comes clean from center. This is a sponsored conversation written by me on behalf of WhiteWave Foods and International Delight. The opinions and text are all mine.